Serengeti Safari Camp was the first mobile safari camp in the Serengeti National Park and is still one of the best. In true semi-nomadic style this Camp moves seasonally, shadowing the wildebeest, and is designed to be in the optimum position to witness the Great Migration. In addition to ensuring the best opportunity to see the wildebeest and zebra migration; the daily game viewing, great bird watching, large herds of plain game and high concentration of predators all combine to offer the ultimate bushcamp experience. Serengeti Safari Camp provides the perfect balance between immersing yourself in the wilderness and yet still enjoying the comforts of a luxury camp. This authentic tented safari Camp is kept small, intimate and simple so as not to have an adverse impact on the environment. It is always positioned close to an airstrip, making it easy to access and combine with other areas in northern Tanzania. Game drives in a 4WD safari vehicle with a private guide are the best way to experience the wilderness of the Serengeti. All guides at the Serengeti Safari Camp are knowledgeable, professional and competent, and recommend early morning drives as this is when the big cats are most active. If necessary, a packed ‘bush breakfast’ can be taken on safari with you for these early starts. Morning and afternoon guided drives with lunch back at Camp or full days with a picnic can be arranged allowing flexibility to cater for each guest’s individual interests. Other activities such as guided walking safaris, fly-camping, bush picnics and hot air balloon flights are offered where possible. The Camp travels hundreds of miles every year, changing location four times to mirror those of the migratory animals. These movements are pre-planned in an effort to be as close to the wildebeest as possible, but given the unpredictability of nature and weather conditions this cannot be guaranteed. From December to March the Camp is based on the southern plains and around Lake Ndutu, where the wildebeest herds spread out widely to graze and life begins for half a million wildebeest calves. In the months of April and May the southern plains dry out and the rut begins; herds start their journey north, through the Moru kopjes in central Serengeti. 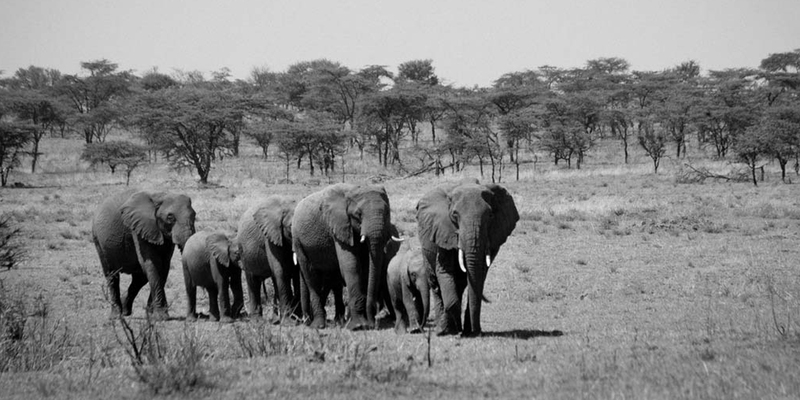 During June and July the herds gather momentum and enter the Serengeti Western Corridor. Here the wildebeest and their young calves meet their first serious hurdle; the Grumeti River and its huge crocodiles. 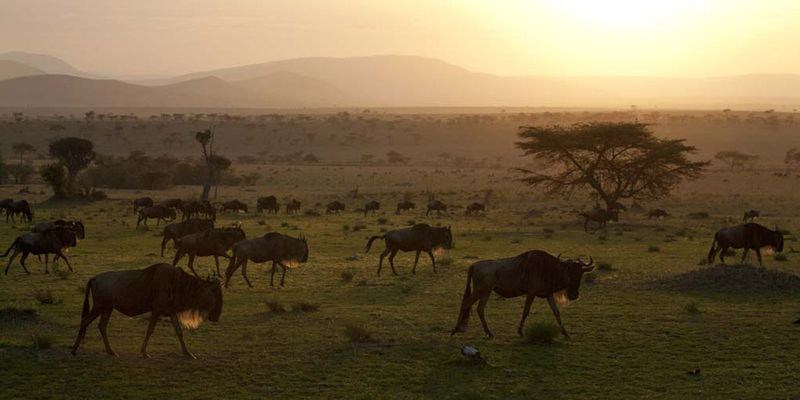 Usually the migratory wildebeest reach the northern region of the Serengeti in August, arriving in the Kogatende area. Here they graze on the grasslands alongside the banks of the Mara River, before risking their lives crossing the treacherous waters with the resident crocodiles and hippos. This dangerous crossing is also made on their return journey from the Maasai Mara region in October/November. 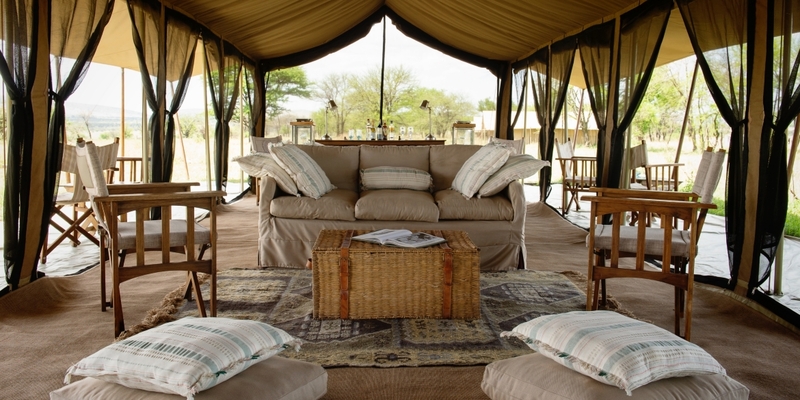 The Serengeti Safari Camp is always in the best locations for game viewing all year round. 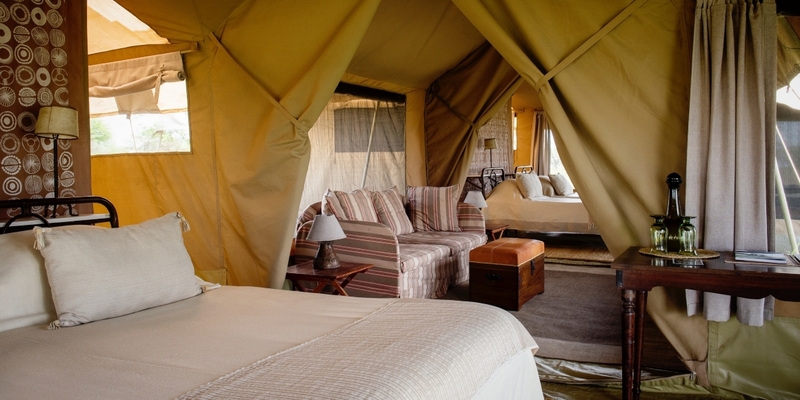 Serengeti Safari Camp has six open-plan meru style tents with en-suite bathrooms at the rear. These spacious tents are cleverly staggered a good distance apart to increase privacy and all have unsurpassable views of the Serengeti. 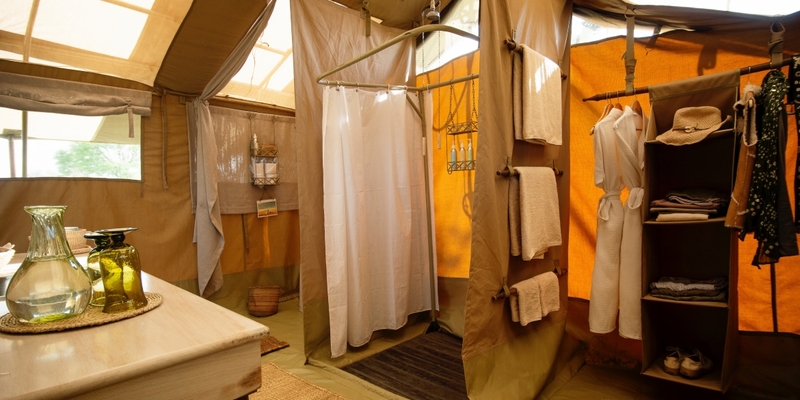 With deeply comfortable beds, flushable eco-toilet and safari bucket showers they are simple and colonial in style but with little luxuries that travellers wouldn’t get in a traditional bushcamp tent. Guests wake with the sunrise, bird calls and start the day with a hot tea or coffee brought to the tent. The main communal dining and lounge tents sit amidst the guest tents, with a firepit area right in front where guests gather for pre-dinner drinks and exchange stories of the day’s wildlife sightings. Meal times are a sociable affair and much like a dinner party atmosphere, with a variety of international-style dishes served. For a more romantic and intimate dining experience, dinner may be served on the private veranda of your guest tent. 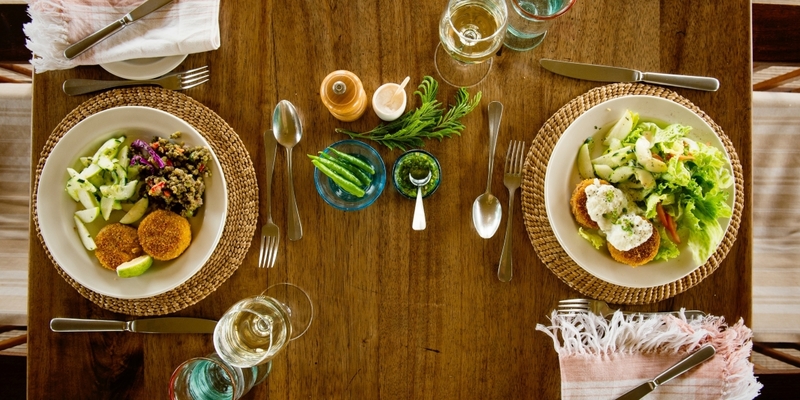 Food at Serengeti Safari Camp is first class and the Tanzanian staff are friendly, efficient and look after guests needs down to the smallest detail. 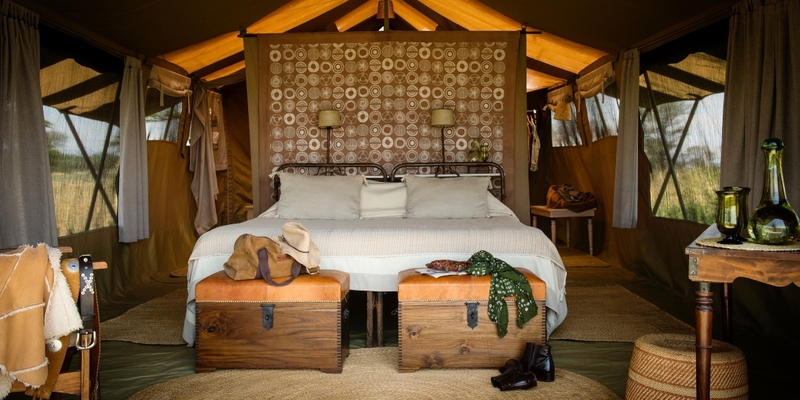 This Camp is a perfectly positioned, rustic yet luxurious base, where guests feel at one with nature and can enjoy the ultimate ‘into the wild’ experience.